Never Enough Nails: Nicole by OPI Gumdrops Part 2! 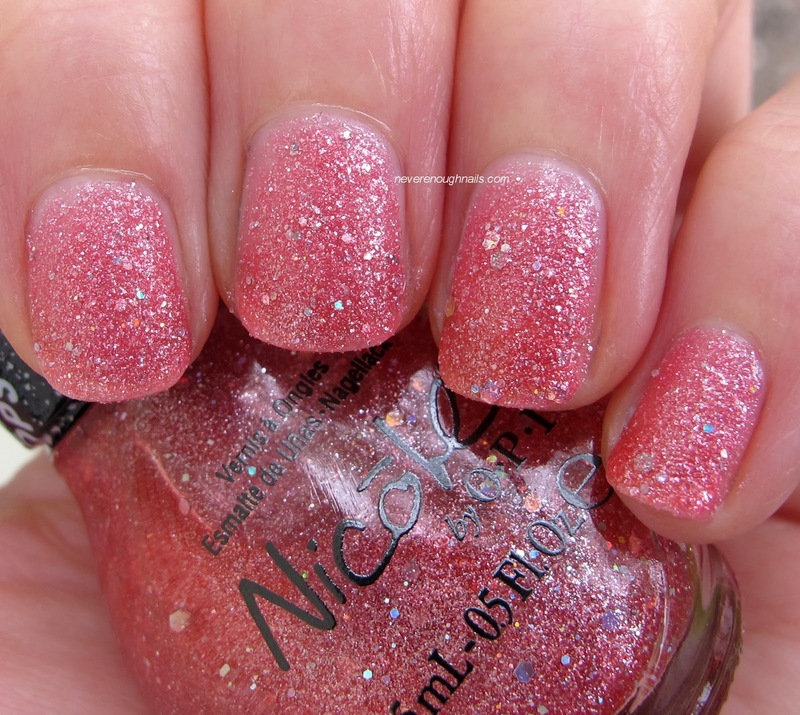 The Nicole by OPI Gumdrops collection was sent for review. All opinions are my own honest thoughts. Today I have the swatches of the other three Nicole by OPI Gumdrops (texture) collection. It seems that Connecticut weather is feeling very anti nail blogger right now, because every time I go to swatch something, it is cloudy and drizzling. Please excuse any raindrops you might see in these pictures. First up we have Nicole by OPI I Lilac Gumdrops. 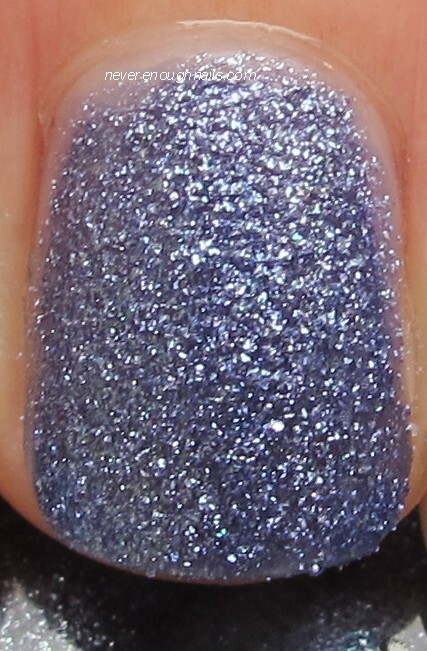 This is an interesting polish because it has a shimmering matte light purple base with silver glitter. Most of the texture polishes we've seen have been totally matte bases with glitter, so the shimmering yet matte base is very cool. I think the shimmer was more noticeable in person than in pictures though. If you look at the bottle in person, you'll see what I mean. Speaking of the bottle, I'm holding the wrong bottle in these pictures! What a dope... I didn't even realize this until I had removed I Lilac Gumdrops and put on the next polish! Just one of those days, I guess. I Lilac Gumdrops was a little on the sheer side, needing three coats for full opacity. The formula was pretty good though, I didn't have any real complaints. I Lilac Gumdrops is probably a cousin of Zoya Stevie, but the shimmering base in Gumdrops makes it slightly different. Below you can see I Lilac Gumdrops with one coat of Gelous. Nicole by OPI Candy Is Dandy is a medium pink matte base with silver glitter, small silver holo glitter and larger silver holo glitters. I really like the holo glitters in here, they add a nice touch and make Candy Is Dandy different from other pink textures. And if you're thinking this is similar to OPI The Impossible, it's not at all. They are totally different pinks (The Impossible is a darker more saturated fuchsia) and The Impossible has pink holo glitter and silver holo stars. Candy Is Dandy also needed three coats to get rid of any pesky VNL. The formula was a nice consistency though and easy to apply. The picture below shows Candy Is Dandy with one coat of Gelous. It's very pretty like this as well! I was so excited about the gorgeous color of Nicole by OPI Blue-berry Sweet On You that I grabbed this bottle to hold while taking pictures of I Lilac Gumdrops, haha! Blue-berry Sweet On You is a stunning blueberry matte base with silver glitter. This color is just a really unique and nice mix of blue and purple, I can't think of anything like this! It looks a little more blue and less unique in the bottle, but once it's on the nail, it really looks amazing! Lucky for Blue-berry Sweet On You, I love the color. The formula is not my favorite. It was thicker than the other polishes in this collection. When I was applying the second coat, it seemed to wipe off some of the first coat (even though I had let the first coat dry for almost 5 minutes). You can see a spot on my ring finger that I just couldn't get covered. If you let this dry completely in between coats, that would probably solve the problem, but it would also be the longest mani ever, since complete dry down takes 10-15 minutes or more. This is three coats. The polish is pigmented enough for two coats, I was just trying to get rid of any bald spots. Below is Blue-berry Sweet On You with one coat of Gelous. Of the 6 polishes in the Nicole by OPI Gumdrops collection, I think three are totally unique (Blue-berry Sweet On You, Cinna-man of My Dreams and Candy Is Dandy). I am totally in love with four of them (the three mentioned, plus My Cherry Amour) and with the exception of Blue-berry, I liked the formula for all 6. Because Blue-berry is such an awesome color, I can forgive it for being a little difficult. Divas can be hard to work with, but so worth it. Have you seen these in the wild yet? I saw them at CVS, so keep checking back if you're looking for them. 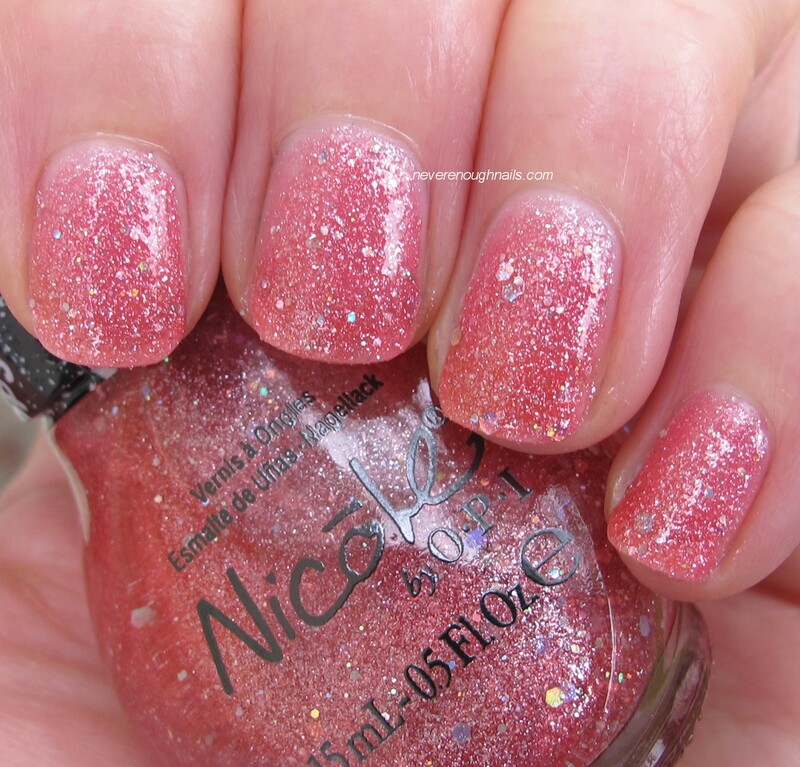 The Nicole by OPI Gumdrops collection is available now at drugstores near you. dandy is so cute. might have to get it. It is really cute Pretty!! I like all of these a lot!